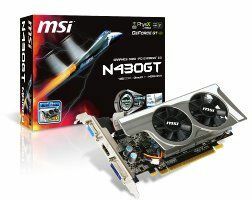 MSI has announced its N430GT series graphics cards – with the low profile Nvidia card offering twin coolers, along with PhysX and 3D Vision technology. The MSI N430 GT uses now familiar MSI technology like Super Ferrite Choke and Afterburner software. "The world class graphics card and mainboard manufacturer MSI officially launches the N430GT series graphics cards supporting GPU and Memory double voltage," explains MSI. "A low-profile design accommodates most HTPC chassis. "The Military Class Concept components includes SFC (Super Ferrite Choke) that improves overclocking capability, and all-solid capacitors to increase performance and durability. N430GT series graphics cards support NVIDIA PhysX and 3D Vision technology, making it the best choice of new generation HTPC graphics card," it adds. The card also offers HDMI 1.4a with 7.1 TrueHD and DTS-HD non-ditortiobn high-quality sound format transmission.